December 31, 2016: Konishi forgot to take Beat’s Lv. 1 Keypin, so we could get through this wall in the 104 Building area. Or did she? She lifted the ban on Reapers attacking Players. But that and the Outlet Pin still did not help the Reapers that attacked us. Beat freaks out when someone calls him by his real name. December 30, 2016: Neku received a text saying that this Game only has one Player. He had to flee some Noise, only to be caught by Kariya and Uzuki. Neku apologized to Shiki and Joshua in his head, but then Beat arrived. The two Reapers heaved exasperated sighs. January 26, 2012: “Who the hell would want a mic with wings?” asked a Reaper. How about everyone?! Neku and Joshua met 777, the leader of the band Def Märch. The Players had to retrieve the band’s stolen mic. The box art. From left to right, bottom row: Joshua, Neku, Shiki, and Rhyme. Top row: Beat. 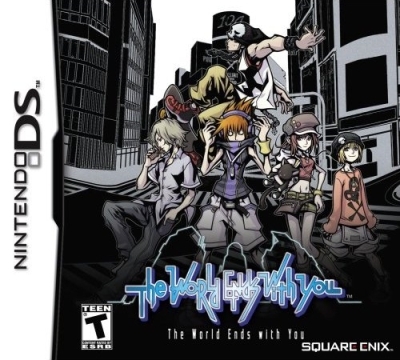 December 31, 2011: The game’s intro flashes a series of images as protagonist Neku Sakuraba runs past most of the characters in the story. The opening theme, “Twister”, is pretty cool and gets the game’s incredible soundtrack off to a good start.